A restaurant in the Old Town of Nice in the Provence, France is one of the best places to get some delicious pizza. 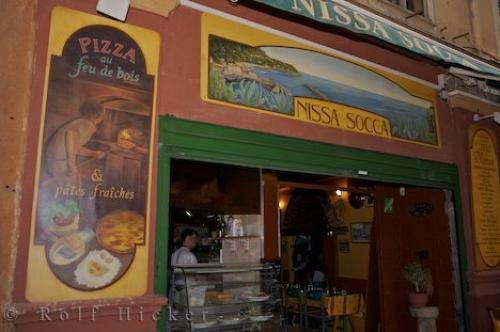 Photo of a restaurant in Nice, France which serves up the best pizza. ... Do not bother bringing your credit cards to the restaurant as they are on a cash only basis.While on your travels in the Old Town of Nice, France and you are looking for a place to eat and relax for a short time, then Nissa Socca Restaurant is the ideal place to a get a quick and inexpensive meal. The service is great and the staff at this restaurant are always smiling and very courteous.Restaurant Pizzeria in the Old Town of Nice, Provence, Cote d'Azur, France, Europe. I photographed this photo with the digital SLR camera model Canon EOS-1Ds Mark II, aperture of f/4.0, exposure time of 1/60 sec. on ISO 100, as always I used a original Canon Lens, the focus lenght for this picture was 28mm.